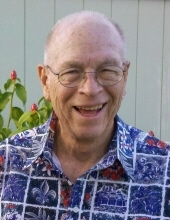 Age 85, of Kailua, Oahu passed away on June 14, 2018 in Kailua. He was born in Detroit, Michigan. Robert was retired as the owner of D.P. Schulte Optical. He was also a veteran and a 1st Lt. of the U.S. Air Force. He is survived by his wife Magdaline Schulte, daughters Carol Schulte, Marguerita Molina-Schulte (Tedi) and Kathleen Schulte; sons Thomas Schulte (Patricia), William Schulte (Kimberlee) and Edward Schulte; brother - James Schulte (Sandy). To send flowers or a remembrance gift to the family of ROBERT THOMAS SCHULTE, please visit our Tribute Store. Eulogy 4:30 p.m. MASS 5 p.m. with reception to follow. "Email Address" would like to share the life celebration of ROBERT THOMAS SCHULTE. Click on the "link" to go to share a favorite memory or leave a condolence message for the family.